Western Australia’s Kimberley region has been recognised as one of the ‘must see’ destinations in the world by highly respected international travel publisher Lonely Planet. 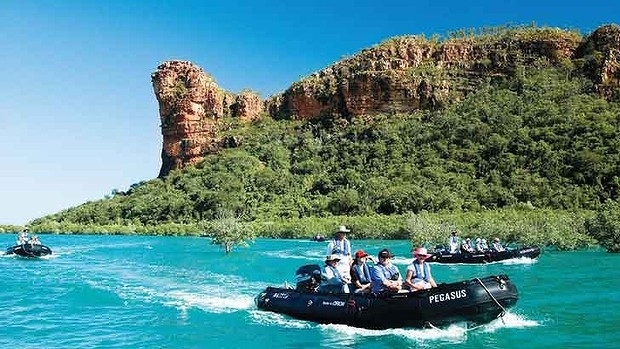 Tourism Minister Liza Harvey said Lonely Planet’s endorsement of the Kimberley as one of the worlds ‘Top 10 Regions’ for 2014 was a massive boost for the region’s tourism industry. “Not only did the Kimberley make the top 10, but it was named in second place and is the only Australian region on the list, which is a huge accolade,” Mrs Harvey said. Lonely Planet described the Kimberley as ‘one of the most sparsely populated regions on the planet and one of the most starkly beautiful, carved by giant gorges, dimpled with deep, cool pools and home to a coastline that could make Australian east-coasters weep’. The guide also labels the Gibb River Road as ‘the ultimate road trip’. Lonely Planet's ‘Top 10 Regions’ list is part of its ‘Best in Travel 2014’ series which identifies the best trends, destinations, journeys and experiences for the upcoming year. “The timing of this recognition could hardly be better with the Kimberley featuring in one of Tourism WA’s two new Experience Extraordinary brand films,” the Minister said. The ads are being screened on free-to-air TV and in cinemas in Melbourne, Sydney and Perth and on pay TV and outdoor cinemas across the country as part of a $3.6million campaign. “As well, WA’s ‘Best Jobs in the World’ Taste Master Rich Keam spent three amazing weeks in the Kimberley to start his six months posting, sharing his experiences with the world via the Taste Master blog, Instagram and Twitter,” Mrs Harvey said.